Three New Films. One Is A Must See. Film reviews by Ellen Miller. Take a deep sigh, hold your breath, and submerge yourself into a theater playing this film. Just sink into the world created by the Mexican director Guillermo del Toro. This fantasy — which I had been putting off seeing because those sorts of movies are just not my thing — is thoroughly moving and enjoyable. It’s also very creative and clever with superb acting. It well-deserves its Best Picture (and 12 other Oscar nominations) for which it is nominated. 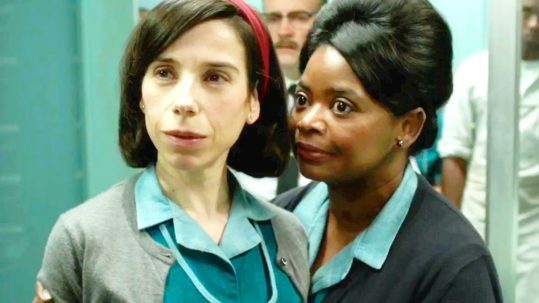 When summarized, the story seems odd and off-putting, but as it unfolds on the screen, it’s not: a young, mute lonely woman, Elisa (Sally Hawkins), is a building cleaner at a super secretive government laboratory when she discovers a captive Amazonian human-like sea creature that is being held for unknown, but presumably experimental purposes. She extends herself to it, and it responds to her. The time is 1962 and the Russians want to steal it from the US who has it locked in a top secret laboratory. She needs to save the creature from both of them. She has two friends who will help. One small warning: there are a few gruesome scenes, but they only add to the surrealism of the film. Don’t be turned off by the plot. The film is filled with fascinating characters and wonderful acting, from Hawkins herself to Octavia Spence, Doug Jones, and Michael Shannon. The staging is so richly detailed you want to disappear into it. My advice is just to given into it and cheer for our heroine. Let the film wash over you. You won’t regret it. What I love about the DC Cinema Club is that we see films we might not otherwise left to our own choosing. That’s definitely the case with A Fantastic Woman. What you see is not what you get in this film. It is a very sympathetic and sometimes heart-wrenching portrayal of a trans woman and the struggles she faces to become the woman she is as well as how she moves forward after losing her lover. There are wonderful cinematic moments to illustrate her struggles and terrific acting throughout. 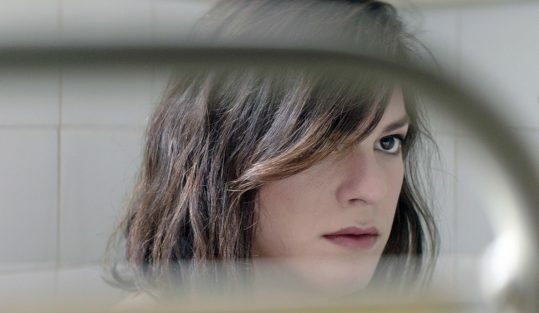 Daniela Vega (Marina) has been nominated for an academy award for her performance and the film has been nominated in the Best Foreign Film Category. Marina is a singer and a waitress in a coffee shop and she is in a relationship with Orlando (Francisco Reyes), a man two decades her senior. One evening he falls ill and dies and the drama begins, unfolding slowly with considerable melodrama. His family forbids her from attending his funeral. But she insists on paying tribute to her lover. The film is a tender love story and a story about the struggle to be true to who you are. It is a tense, well-filmed and emotional drama. It’s worth a see. Another non-mainstream film and even though nominated for a Best Picture Award, I recommend it somewhat cautiously. 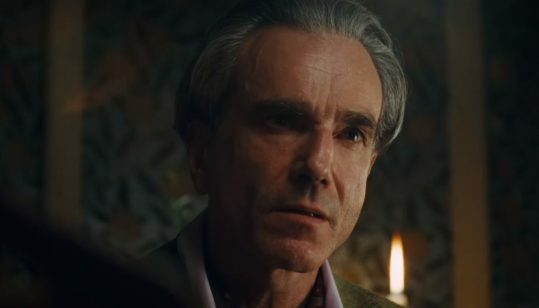 If you like/love looking at Daniel Day Lewis (count me in) it’s a must-see. If you like a story where two unlikable characters clash and the woman “wins” (my view), then this is the picture for you. If you love a film where the actions of the women characters are more manipulative than those of the men, go see this movie. (In this latter style, it reminded me of the 2017 film Lady Macbeth. See my review of that film). But not a lot happens in this taut psychological drama. Lewis plays a perfection-obsessed famous London-based courtier — Reynolds Woodcock — in the 1950’s. His latest muse is Alma (well-played by Vicky Krieps), a former waitress in a country inn where he had dinner one evening. He dresses her gloriously (though the costuming was less inspiring than I expected). They marry, and his self-centered life is disrupted. When he appears to begin to tire of her, she sets about to prove just how much he needs her. The film is lit throughout in undertones of beige, rose, and violet, which is very appealing and adds to the overall somber tone of the film and to the relationship between the two protagonists. Although this film received six various Academy Award Nominations, I’d see this film for Daniel Day Lewis’ performance alone. Film Stars Don’t Die in Liverpool was rated Excellent or Good by 90+ per cent of our Sunday Cinema Club. We both saw it, but didn’t have time to review it. We both would have rated it four stars. For what it’s worth, I thought Three Billboards is a truly excellent film and I hope Frances McDormand’s performance earns her the Oscar for Best Actress. She certainly deserves it. I know the film has received somewhat mixed reviews, something I do not understand. We agree as you can see in this first paragraph of the review by Ellen Miller on MillersTime: “Another must-see film. I think it’s one of the best-acted, directed and written films we have seen all year. Ahem. Think best actress for the star (Frances McDormand) and best screen play for the writer/director Martin McDonagh.” Go to: http://www.millerstime.net/2017/12/09/six-more-movies-to-consider/ for the full review.